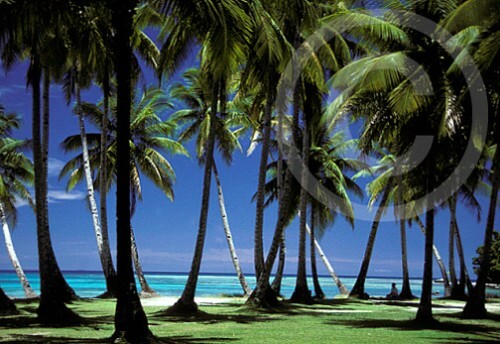 Take a peek at the photograph below and try to guess where in the world it was taken. Drop your answer in the comment box and check back tomorrow to see if you are right. 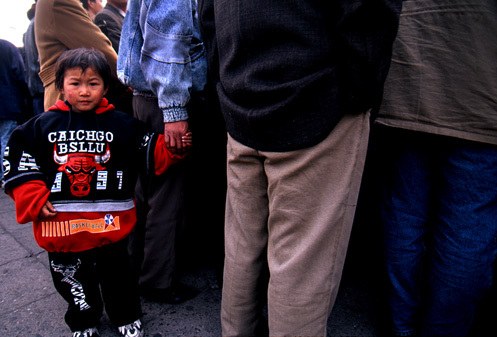 Behind the Scenes: The year is 1995 and Jeffrey is photographing on assignment for The New York Times Travel Section in Beijing, China. He’s there to do a story about Ritan (Temple of the Sun) Park. This expansive park is one of the oldest sites in Beijing and is like an oasis in the midst of a teeming metropolis. Commissioned by Ming Dynasty emperor JiaJing in 1530, it is filled not only with massive trees, gardens, pavilions, and small lakes, but many places for people to gather and recreate. Tai chi and ballroom dancing are common forms of exercise found here. 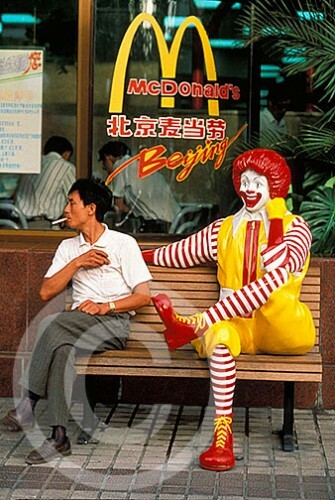 When Jeffrey comes upon this elderly gentleman wearing a traditional Mao jacket, fully immersed in the solitude of his early morning ritual, he knows he has captured the essence of Ritan Park and also created a wonderful symbol of ancient China–still alive and well in modern day Beijing. At its core, tai chi is a martial art (also referred to as shadow boxing), but it is now commonly practiced to strengthen and promote mind/body health. 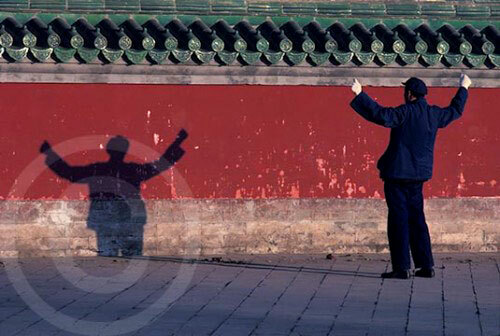 Jeffrey loved how the man was entranced in the shadow of his own dance, and how the traditional Chinese red wall and green tiles melded with the shadow and gesture, creating pure harmony. 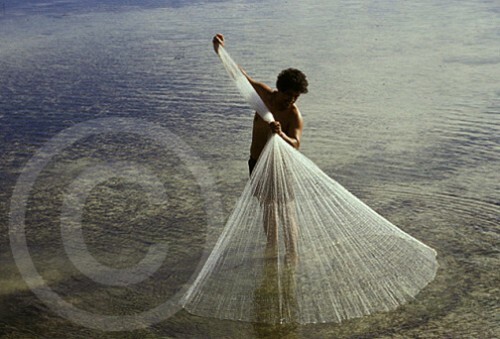 This image was created with a Nikon F4, a Nikkor 85mm lens and Fuji Velvia film. Postscript: A week after it was published as the cover of The New York Times Travel Section, Broadway’s legendary song and dance man, Tommy Tune, wrote a letter to the editor extolling the artistic merits of Jeffrey’s photograph and how he captured the magic of the moment. 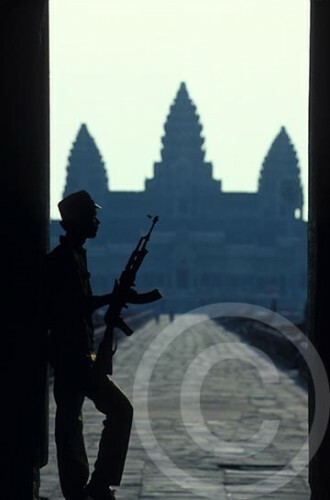 Behind the Scenes: It’s 1989 and the Khmer Rouge are still fighting in Cambodia. Pol Pot’s official reign of genocidal terror has ended, but the aftermath of the “Killing Fields,” as it was coined in the grizzly 1984 film, still lingers. Jeffrey is in Cambodia with Harry Rolnick, a foreign correspondent for the Bangkok Post. 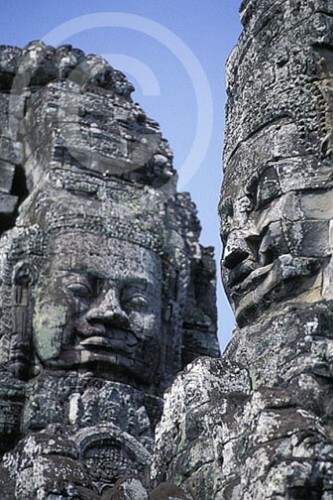 They are there to tell the story of the restoration quietly taking place at Angkor Wat Temple Complex. A handful of scientists from the Archaeological Survey of India have begun work on Cambodia’s most important archaeological site. Angkor Wat, an ancient city built by King Survyavarman II in the 12th century, has taken a beating from years of neglect and non-stop fighting. Khmer Rouge guerrillas have looted temples, decapitated sculptures, and sold the spoils on the black market to raise cash for the war. 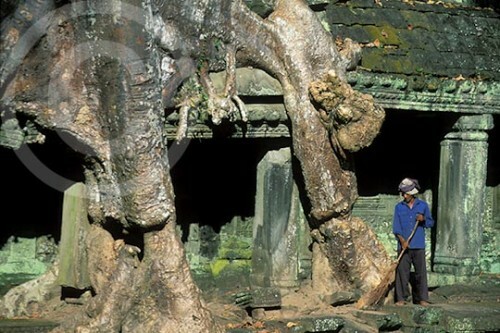 The site’s exquisite Khmer architecture, which is often compared to that of ancient Greece and Rome in importance, has also been strangled by the encroaching jungle. Vines and roots have damaged structures, causing many of its sandstone temples, reliefs, and statues to crumble. The restoration of Cambodia’s most important site (and symbol) is a tiny glimmer of hope for a country that has not dared to hope since the Khmer Rouge murdered approximately two million of its people (one quarter of the population). Because the U.S. still has not established diplomatic relations with Cambodia after Pol Pot’s reign of terror, Jeffrey and Harry must first fly from Bankgok, Thailand to Ho Chi Minh City, Vietnam to obtain a visa to enter the country. 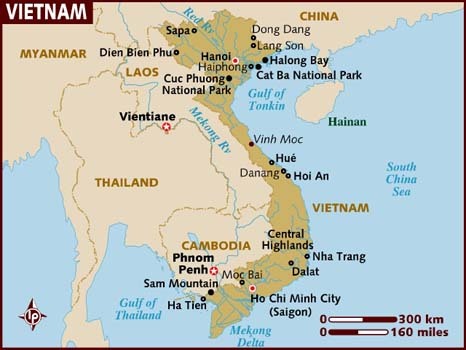 A few days later they will backtrack to the capital of Cambodia, Phnom Penh, then they will catch a puddle-jumper plane to Siem Reap, the province in which Angkor Wat is located. The next day an interpreter and several Cambodian soldiers meet Harry and Jeffrey on the outskirts of Angkor Wat. The complex is over five hundred acres, and they must walk through the jungle to the temples where the archaeologists are working. 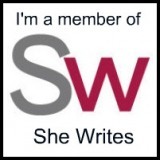 The men are told under no uncertain terms may they leave the single narrow path they plying. Live mines litter the landscape everywhere else. Nearby gunfire reminds them that this is no idle warning. Jeffrey and Harry walk cautiously and stick closely to the Cambodian soldiers who know every inch of the area. The emptiness of Angkor Wat and the heavy air blanketing the jungle creates an eeriness that makes the back of Jeffrey’s neck prickle. Harry continually looks over his shoulder. Even the slightest snap of a twig from a jungle creature or birds taking flight makes them pause. Jeffrey can’t help wonder, How do we know the Khmer Rouge haven’t laid another mine on the path last night and how do we know we won’t be ambushed now? Eventually they arrive where the archaeologists are working. The interpreter introduces the men and points out many of the sites wonders, including giant Hindu sandstone faces, exquisite bas-reliefs, and temples covered in roots more massive than each of them. It doesn’t take long before Jeffrey is able to create a powerful visual story about what is taking place here. After spending the entire day at Angkor Wat, they make their way back out to the other side where a car is expected to be waiting for them. As they reach the outskirts of the site and walk along a road near a small village, they come upon a young boy carrying an AK-47 rifle. This barefoot youngster, who is wearing nothing more than threadbare shorts, is protecting his village against the Khmer Rouge. As he walks under the weight of his gun, his onyx eyes reveal a life that has already witnessed far too much. 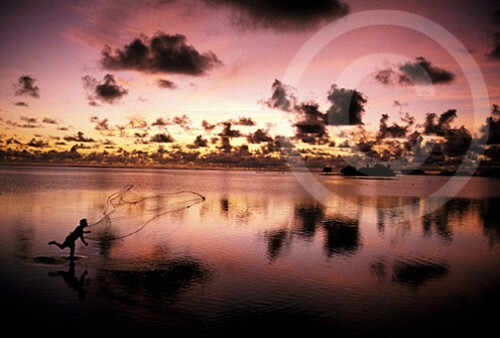 This photograph was created with a Nikon F4, a Nikor 24mm lens and Fuji Velvia film. 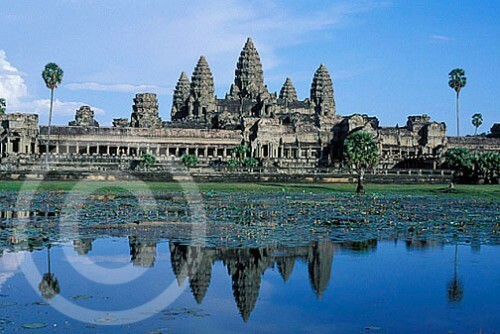 Postscript: Jeffrey has returned to Angkor Wat on assignment two more times since his first trip in 1989, and each time he has witnessed it coming back to life more and more. Restoration is now nearly complete and Angkor Wat has been listed as a World Heritage Site, along with Cambodia’s largest tourist attraction. 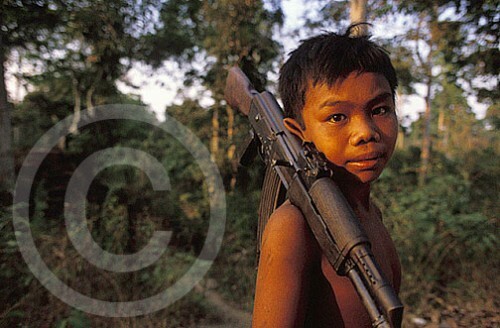 The best part is that Jeffrey has never come across another child carrying an AK-47 rifle in Cambodia. 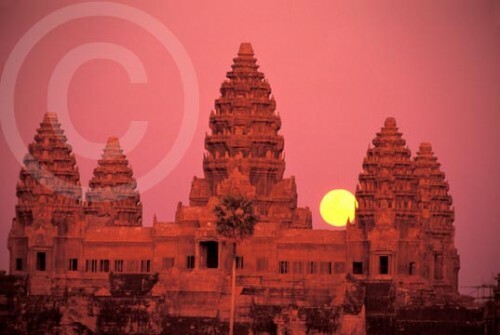 If you want to learn more about Angkor Wat, click HERE. A little while ago the doorbell rang. When I opened the door to see who it was, Mr. Fedex stood there in his neat purplish-blue uniform, smiling his friendly Mr. Fedex smile. Then he handed me a thin blue box addressed to Jeffrey. 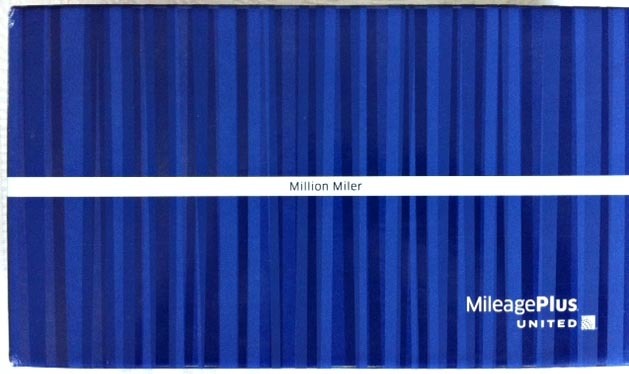 “Million Miler” was printed on top. The package was from United Airlines. Jeffrey has flown well over a million miles gallivanting around the world on United so every once in a while they mail him a “Thank you loyal customer” letter. This time they decided to Fedex it. What could it be? I wondered as I handed Jeffrey the box and joked about all the possibilities. 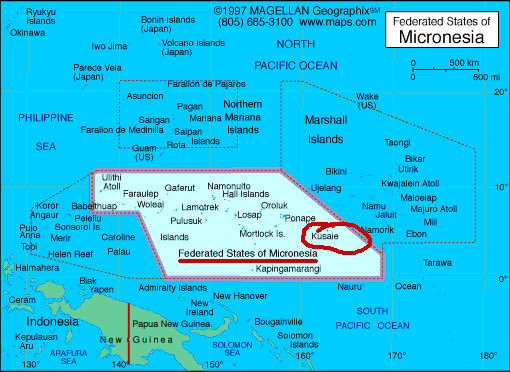 Round-the-world tickets? First-class upgrades? Yeah, right. Clearly it had to be something of substance though since it was shipped via Fedex 2-Day service (ca-chiiing) instead of 3-Day, Ground, UPS or snail mail. 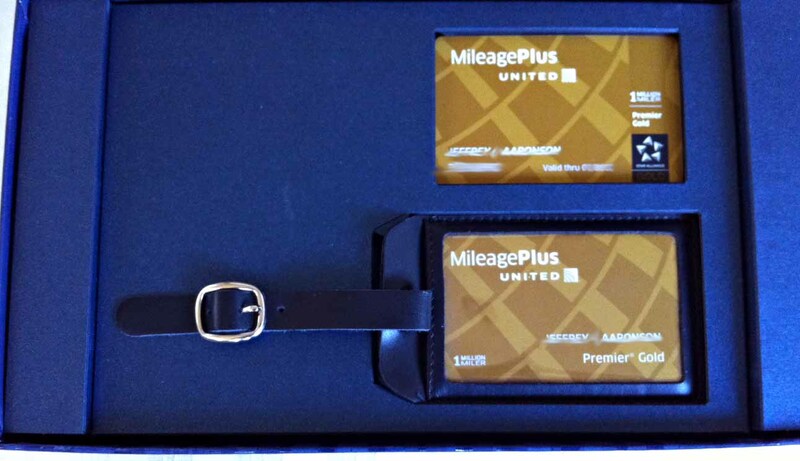 This is what United Airlines felt compelled to spend its precious resources Fedexing to Jeffrey: a leather luggage tag with his name printed on the insert. The packaging alone probably cost five bucks, not to mention the shipping. And don’t even get me started on the packaging waste. Sorry mom, I know you always taught me to be grateful when I received a gift. “It’s the thought that counts,” you’d always say. Technically this is not my gift though, since Jeffrey is the million-mile flyer and his name is printed on the luggage tag, so I don’t feel bad sharing the absurdity of this with you. Here’s a crazy idea, United Airlines: perhaps instead of Fedex’ing tchotchkes to your best customers, spend your moolah figuring out innovative ways not to go bankrupt, or spend it on providing more than a bag of pretzels to everyone when they fly all the way across the country. Or spend it on lowering your fares so more people can afford to travel. PS: Jeffrey, ever more gracious than me, sends his thanks for the luggage tag. He’s still trying to figure out how his bags managed to make it all the way around the world multiple times without it. I don’t need to tell you smart readers what globalization looks like, but clearly it can be amusing at times to see what parts of American culture get transplanted into other countries around the world (at least when it isn’t sad). 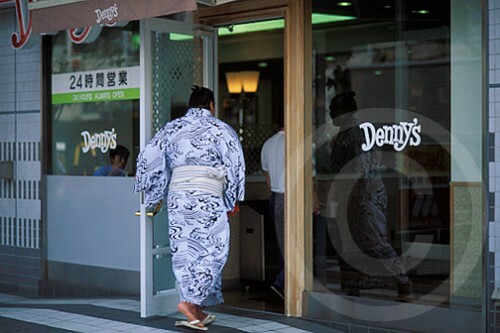 Here is a peek at a few images Jeffrey has created over the years showing what happens when American taste lands in other parts of the world. 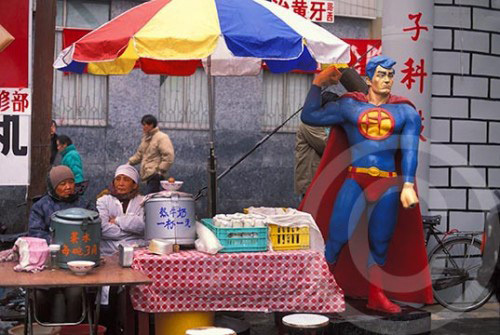 Lhasa, Tibet (selling yak burgers on the roof of the world). If you had one wish, what aspect of American culture would you want to share most around the world (if any)? 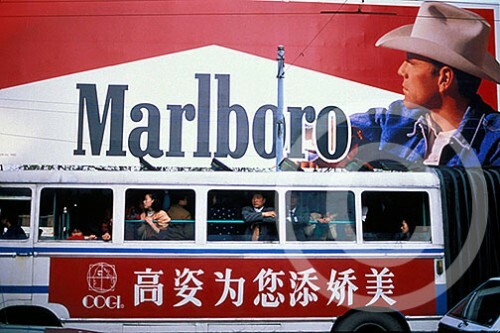 My guess is that it wouldn’t be the Marlboro Man. 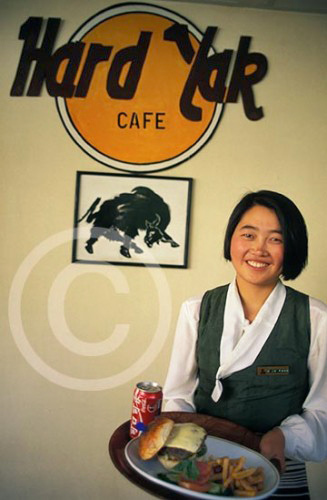 Behind the Scenes: It’s 1991 and Jeffrey is working on assignment for Time Magazine in Pyongyang, North Korea. The stadium is brimming with over 100,000 people, all here to celebrate his birthday. It’s not exactly Jeffrey’s style, being the low-key-birthday-kind-of-guy that he is, but he indulges on this particular April day. First comes music, followed by a parade of synchronized dancers and gymnasts, then flags swirl and paper cards flash into vibrant scenes as they’re turned over by participants. Jeffrey is stunned by the scale of it all. It’s the most surreal birthday of his thirty-six years. 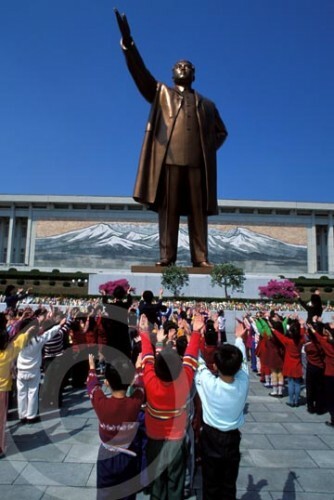 As Jeffrey stands at the top of the stadium stairs, looking out at the sea of North Korean humanity and trying to absorb the magnitude of this patriotic extravaganza, he obediently asks his guide, Mr. Kim, if he can take a picture of the children. 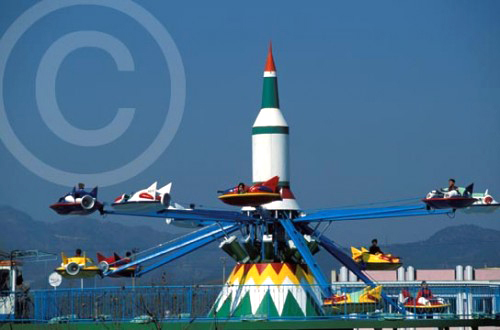 He has been told that he must ask permission to take any photograph while in North Korea. 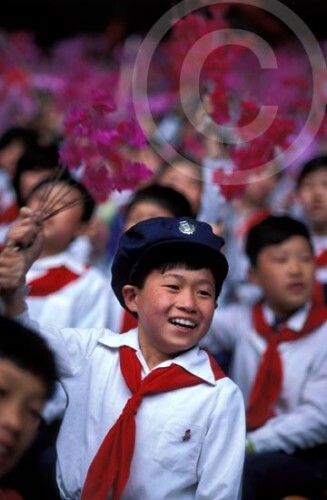 When Mr. Kim nods at his request, Jeffrey lifts his camera to his eye and begins capturing the exuberance of Young Pioneers as they shake bright pink pom-pom flowers in rhythm to the booming music. 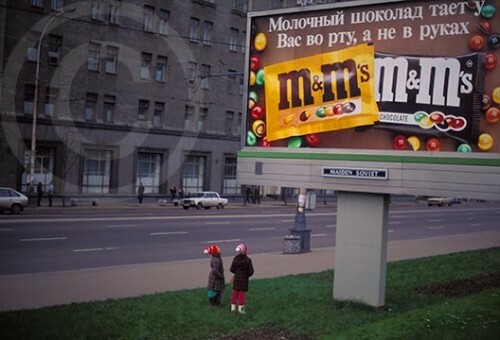 Then he asks if he can photograph the dancers twirling flags and the workers marching with Communist banners. As he does, a thunderous applause suddenly erupts and Jeffrey turns to see what’s happening. 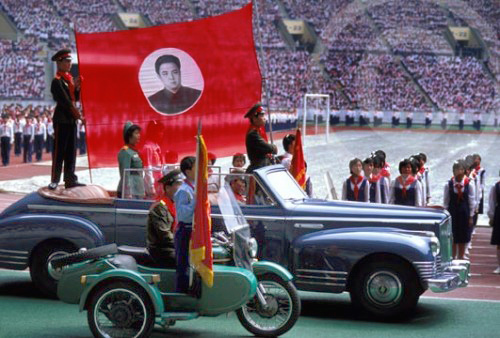 Two 1940’s Russian convertible cars emerge onto the stadium track carrying a larger-than-life banner of Kim Il-Sung and his son, Kim Jong Il. Jeffrey instinctively lifts his camera and starts shooting again. The next thing Jeffrey knows, two powerful hands grip his shoulders and launch him down the concrete steps of the stadium. He sees and feels a cascading swirl of music, pom-poms, faces, sky, and cement. His knee hits first, then his elbow and shoulder, followed by his head, as he tries to cradle his camera to protect it from the fall. 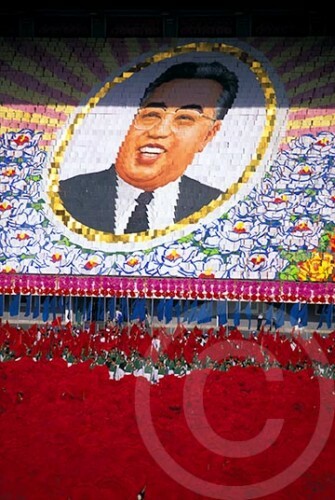 The cult surrounding North Korea’s leaders, Kim Il Sung and Kim Jong Il, is like other place in the world. Every person wears a Kim pin over his or her chest, and every family has portraits of the Great Leader and the Dear Leader in their home. Statues, billboards and paintings are everywhere–from the airport to stores, factories, metros, schools, kareoke clubs and amusement parks. 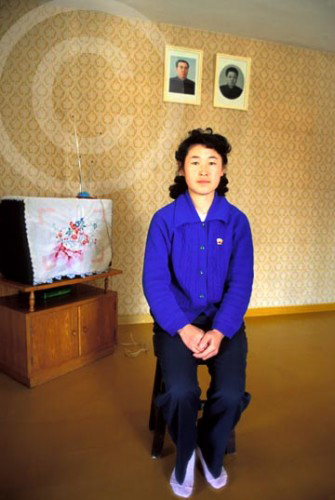 And every child is born under the watchful eye of the Kims, as seen in the photo above of a North Korean maternity ward. 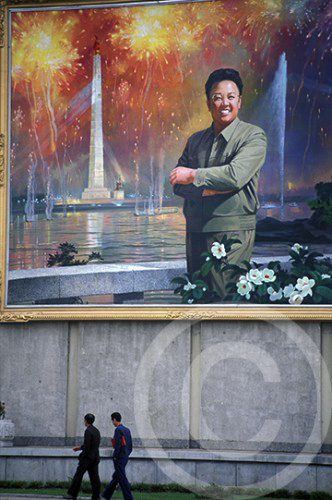 Jeffrey is one of only a handful of American photojournalists to have gained access into North Korea. Not only did he go for Time, but several years later, he manged to get back in for Vanity Fair, a story I will share another time. It only gets more bizarre! Behind the scenes: It’s 1994 and Jeffrey is photographing on assignment for Travel Holiday in the Champagne Region of France. 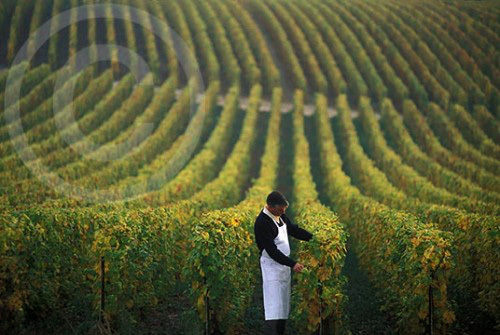 His job is to capture the essence of this region with its renowned vineyards and charming, old world towns. Jeffrey speaks only a little French, but after landing in Paris he loads up a rental car, negotiates his way through the city’s chaotic roundabouts, then finally hits the open road heading toward Epernay, about eighty miles away. His nerves take a beating during the drive, especially without any English signage to guide him, but the beauty of the region creates a soothing natural salve. The following day several men from the Champagne Chamber of Commerce warmly welcome him with a lavish, three-hour lunch, complete with six different types of champagne. Jeffrey, who likes to hit the ground running, tries to quell the impatient feeling needling him while the men laugh and linger, making sure the champagne keeps pace with their stories. Eventually the bubbles begin to travel to Jeffrey’s head, forcing him to lose his natural, high-energy need-for-speed, and relax and fully appreciate the lifestyle of this region. He can already tell that it’s going to be one the cushiest stories he’s photographed in a long time, even if he will have to work hard to photograph everything on his long shoot list. During the next week he plows through more than 70 rolls of film in the visually rich towns of Reims, Damery, Troyes, Epernay and Haut Viller. He photographs everything from vineyards and chalk cellars to wine bars, restaurants, and galleries to people, architecture, and landscapes. He also shoots details like the street sign honoring Dom Perignon, the monk who discovered bubbly. After spending a morning photographing the interior of Castellene du Champagne winery in Epernay, Jeffrey heads to his car. Just as he’s about to load up his equipment and move on to the next location on his list, he sees two workers carrying a giant champagne bottle along the road in front of the winery. Jeffrey knows what he sees before him must be included in the story so he quickly takes out his camera again and begins photographing. He works hard to get the angle which will include both the Avenue du Champagne sign and the shadow. After capturing this quirky moment, curiosity inspires him to find out what they’re doing with the giant bottle. “Once a week we have tastings in the garden and we bring these large bottles out for ambiance. People enjoy sipping champagne beneath these big bottles,” a worker laughs as he explains in his thick French accent. 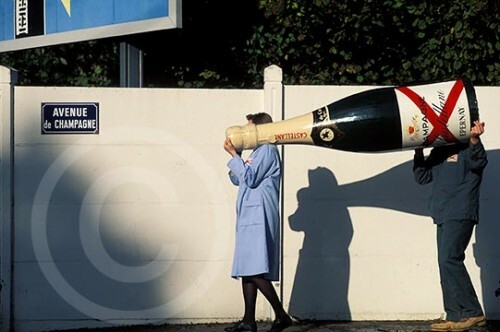 Though dozens of photographs from this shoot have been published around the world, this giant champagne bottle has captured peoples’ imaginations the most. 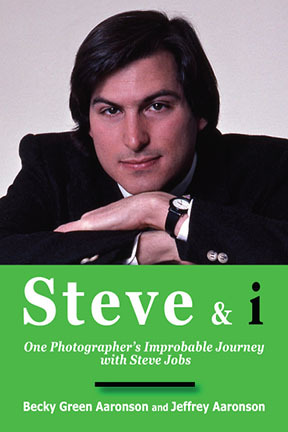 It has been published in magazines, on cards, and inside Communication Arts where Jeffrey received an award for it. 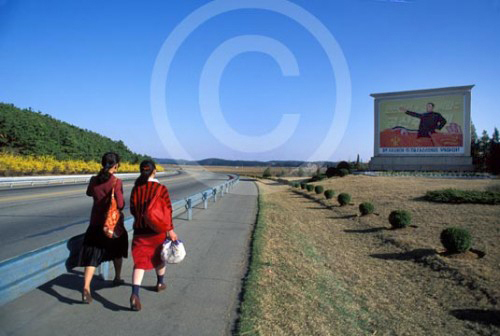 This image was created with a Nikon F4 camera, a Nikor 85mm lens and Fuji Velvia Film. 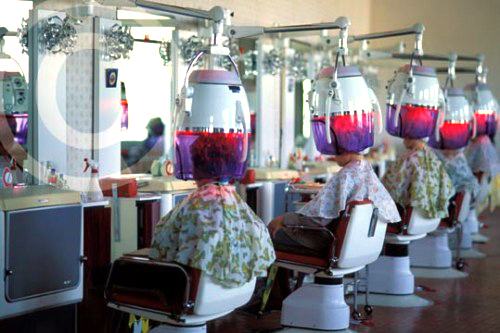 Would you agree that this picture begs for a creative caption? I’d love to hear your ideas. Send me your best! Behind the scenes: It’s 1992 and Jeffrey is on his way from Thailand to Cambodia to photograph a story about Angkor Wat Temple Complex. In order to enter Cambodia though, he must first stop in Vietnam to get his visa processed. The U.S. still has not re-established diplomatic relations with Cambodia after Pol Pot’s Killing Fields so he’s forced to take a circuitous route. It’s early morning in Saigon (Ho Chi Minh City) and as Jeffrey sits on the rooftop restaurant of his hotel, sipping orange juice and reading his Herald Tribune, he begins mentally planning his day. 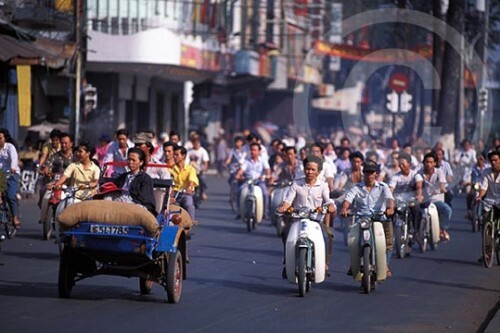 Below, the streets teem with motor scooter drivers and vendors as they begin their daily frenetic ritual of eeking out a living. In the midst of the city’s cacophony, Jeffrey also hears another sound warbling in the distance. He knows he’s heard it before in other regions of the world, but never in Vietnam. An Islamic call to prayer wafts through a loudspeaker, a muezzin’s sing-songy voice summoning Muslims to prayer. Curiosity instantly changes the course of Jeffrey’s day. Instead of heading to the Dan Sinh Market like he had planned, or photographing the Apocalypse Now Bar or the city’s wide boulevards and French colonial architecture, Jeffrey begins his search for the mosque. First he must maneuver through the certifiably insane, always-rush-hour-traffic, then he must get on the back of a motorcycle taxi before he is eventually dropped off in front of the Saigon Central Mosque in the Dong Khoi area. A sea of motor scooters dots the sidewalk in front of the light blue and white building. Its cool, immaculate structure exudes calm, floating like an island of serenity in the midst of the churning streets outside where sensory overload is the norm. Jeffrey removes his shoes, and like other men, washes his feet before stepping onto the cool stone floors. The city’s heat, humidity and noise instantly fade away. Though he isn’t sure what kind of reception he will receive, Jeffrey is warmly welcomed into the mosque and is even encouraged to photograph during Friday prayer. The men pray on one side and the women on another. 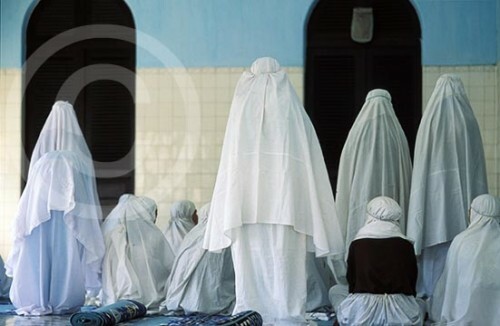 Jeffrey’s eye is immediately drawn to the clean lines and undulating pattern of the women praying before him. In no time he raises his camera and begins photographing. After shooting a handful of frames, he lowers it back down and puts it away, hoping to avoid disturbing this sacred time of worship. Instead he watches and listens, enjoying his unexpected discovery in Vietnam. What Jeffrey likes most about this photograph is that most people think it was created in Africa or the Middle East rather than Vietnam. He likes the surprise element, and also the anonymity of the image, which allows viewers to imagine what the faces look like behind the traditional robes. “It’s also a good reminder that curiosity is often my most powerful tool. 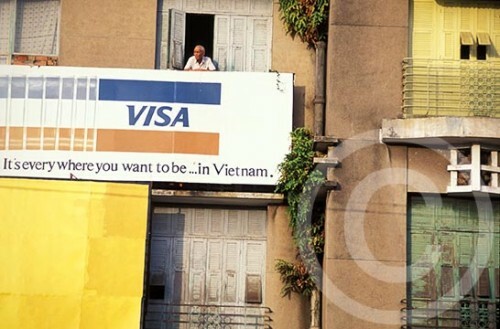 If I hadn’t been curious, I never would have discovered this part of Vietnam,” Jeffrey says. This photograph was created with a Nikon F4 camera, a Nikon 85mm lens and Fuji Velvia film. It was awarded a PATA Gold Award. Now I’m curious! 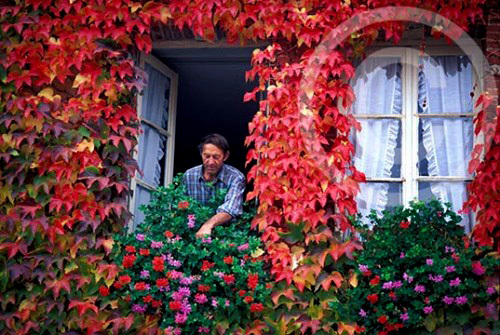 What is the most interesting or unusual place you have discovered while traveling, simply by following your curiosity?